This expedition travels across an extraordinary diversity of landscapes and vegetation, the scenery changing constantly. Both the Nullarbor and the Great Victoria Desert are veritable Botanic Gardens teeming with life. Departing Coober Pedy, (which is serviced daily by Rex Air from Adelaide) we travel west on the famed Anne Beadell Highway through Aboriginal Land to Tallaringa Nature Reserve. We visit once top secret ground zero at Emu Field, the site of the first atomic tests on Australian soil. We cross the GVD along the Anne Beadell Highway to Laverton. From the goldfields we return across the northern Nullarbor, crossing expansive and evocative sweeping plains. This program offers an astonishing diversity of landscapes and scenery. We enter the magical Great Victoria Desert. Over the next five days we travel westward, largely along internal corridors thick with an astonishing array of vegetation. The road we take is the Anne Beadell Highway, which is really a track not a highway. We enter Marlinga Tjarutja Aboriginal Lands and travel west to the first junction Vokes Hill. On through the desert we enter the Mumungari Conservation Park. We preferred its previous name “The Unnamed Conservation Park”, but who are we to stand in the way of progress. The park is an UNESCO World Biosphere reserve. The vegetation is stunning, with karrajong, acacias, hakeas and majestic marble gums. We cross the paloedrainage basin known as the Serpentine Lakes. We camp on beautiful red clay pans surrounded by native pines. We visit Aboriginal wells, one of Australia’s most extensive Aboriginal stone arrangements, the wreckage of a Goldfields Airways twin engine Cessna that crash landed in 1993. 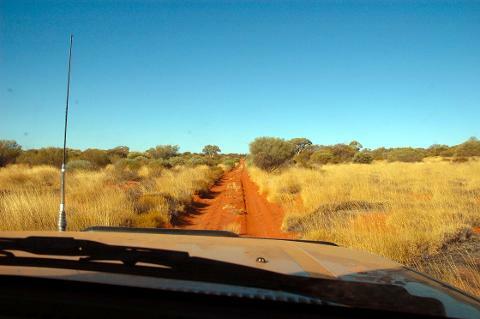 We visit Australia’s most remote roadhouse at Ikkurlka, the crossing of the Connie Sue Highway at Neales Junction, and eventually arrive in Laverton in the Western Australian Goldfields. We trek eastward to Pinjin, a ghost town where little remains of a brief gold rush in the early 20th century. We gradually enter more and more remote country. We take a walk around the Kirgella Rocks, scenic granite outcrops. We visit Queen Victoria Springs, named by Ernest Giles and gradually make our way into the Plumridge Lakes Nature Reserve. The first Europeans to Plumridge Lakes was Ernest Giles party in 1875. The next visitors were the Elder Scientific Exploring Expedition led by David Lindsay. The lakes were eventually named by the explorer Frank Hann in 1908 after one of this travelling companions. The Plumridge Lakes area was an important region for Sandlewood harvesting from 1930s until 1980s. Ater exploring Ooldea and the surrounding area we travel east through sandhills to Wynbring, and extraordinary granitic outcrop. There are some wonderful short walks to be enjoyed in the area. Ater exploring Wynbring we follow alongside the vermin proof fence past Lyons to Malbooma and on to Tarcoola, the junction of the Sydney-Perth and Adelaide Darwin railway lines. Tarcoola reputedly has a population of two since the Pub, one of only two iron- clad hotels in South Australia closed. We continue on past Wilgena and Ferguson sidings to Kingoonya, where there is a pub that’s still open. Kingoonya is reputed to have the widest main street in Australia, but since the railway was rationalised, all there really is left is the pub.From here we travel south past Lake Gairdner and camp along the road to Gawler Ranges National Park.